This drainage improvement project included three (3) main design elements: an inlet transition structure at Mt. Vernon; an outfall structure into Gypsum Creek; and redirecting open channel flow between S. Fabrique and Windsor, into a reinforced concrete box storm sewer with area inlets. As shown in the adjacent photograph, existing property fences, backyard landscaping, and confined workspace presented some unique challenges for the YOUNG & ASSOCIATES design team. During the hydraulic analysis and computation phase of the project, Y&A examined various alternative pipe and box sizes to establish the most efficient combination of flow capacity, space allowance, and construction cost. 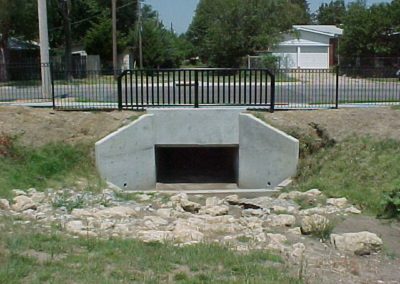 Storm sewer inlets and transition structures were incorporated into the final design to reduce flow velocity and improve overall local drainage. Public meetings were also conducted with neighborhood groups to ensure that the project could be constructed without adversely affecting existing landscaping and private property. The resulting design project was extremely effective in improving storm water conveyance, increasing property value, and improving water quality discharge into Gypsum Creek.